iPhone Charging Dock Station - Now Just $6.49 and FREE Shipping! 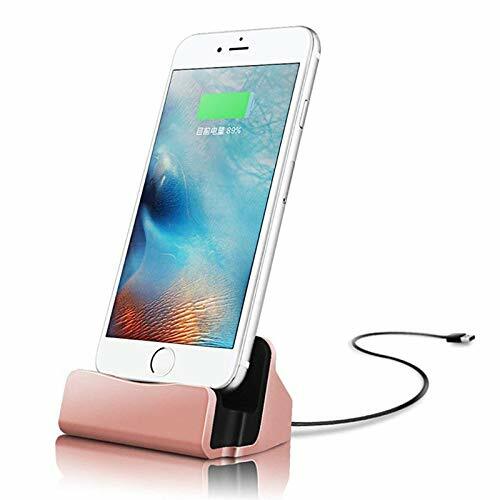 iPhone Charging Dock Station – Now Just $6.49 and FREE Shipping! Coupon code SO7OSPOV drops the price 50% to $6.49! IPhone charge dock with dock and sync function. No matter use as dock or charge with the lightning cable or connect the dock to your laptop or desktop computer via a USB port to enable file syncing for all your music, videos and photos, it is rather convenient. Built-in protection circuitry to prevent overcharge, over-discharge. High temperature molecular fireproof materials, safe and reliable performance,ensure charging as well as using your phone. To prolong your phone service life, please keep in mind that over 5V-1A Power Input is strictly prohibited. Bottom adopt anti-slip design, the bottom of the dock stick anti-slip silicone pad, increasing friction with the desktop, protecting your phone from sliding and the desk from scratching.Stable and reliable, safe to use on any smooth place. Small size and compact style, easily carried to everywhere.When the battery falls down,just take it out easily and charge your phone saving all the trouble of plugging and unplugging.Besides,the dock made from frosted material can be used for a long time without worrying about frictional damage. Compatible with Apple iPhone 7 /7 Plus /6 /6S / 6 Plus/ 6S Plus/ iPhone 5S/ 5 iPad and iPod touch (5th generation).Compatible with both lightning USB cable ,PC or wall charger. Please note:If you find the charging dock doesn't work, maybe your case is too thick,please take off the case from your phone temporally when charging.Any question,please feel free to contact us and be confident to buy. Compatible:The charger stand designed for iphone,compatiable to any iphone type. Steady:It stands very stable and holds your phone firmly,and you can use it in car. Easy to use:With fine connector,very to plug and unplug your phone,prolong the life use.